Greetings to all of you readers in the Low End Mac web-isphere! As one of the newest writers on this site, I wanted to take a moment to introduce myself. I have been a reader of the Low End Mac website for many years now and am also a member of its Facebook group. Now as a member of the staff, I will be part of the bigger picture. It’s such a great feeling! I am so excited and looking forward to contributing articles for your reading pleasure! I am a dedicated Mac user all the way and have been an Apple fan most of my life. The first Apple computers I ever used were Apple II machines in elementary school. The first-ever computer we owned in my family was a Macintosh Performa 630CD, which I persuaded my parents to buy so that I didn’t have to spend so much time after school doing homework in my high school’s computer lab – which was a Mac lab by the way! – with LC-based machines. I have owned 16 Macs from desktops to notebooks, 13 purchased and 3 acquired, ever since I bought my first one in 1998, a Power Macintosh G3 All-in-One. (My actual first article for Low End Mac will revolve around that machine. Stay tuned!) And that number doesn’t include the non-computer Apple devices I have owned. I currently own three Macs, a Late 2008 Unibody MacBook Pro 15-inch and an Early 2009 iMac, both running Mac OS X 10.6 Snow Leopard, and my most recent a Mid 2011 MacBook Air 11-inch running macOS 10.12 Sierra. They were either new and current, that being the first, or fairly new at a year old when purchased, those being the latter two. Fast forward to 2018, and the age of my computers makes me an official low-end Mac user! I live in the S.F. East Bay and was also raised there (but was born in another state). As far as my background goes, I have been formerly and primarily an educator in the elementary school setting for 17 years, most recently as technology coordinator, teaching computers (on Macs, of course!) to students in pre-K to 8th grade and as a journalism advisor, advising newspaper and yearbook as well as teaching journalism to students in grades 5-8. A photo published in the San Francisco Chronicle from Macworld Expo 2009, the final appearance by Apple, during the Keynote in the Moscone Center featuring Joe Leo, left, and two other tech journalists live blogging the event on their Mac notebook computers. Photo: Mike Kepka / San Francisco Chronicle / Polaris. This photo was first published on January 2009 in an online photo essay on sfgate.com about the Macworld Expo a day after the Keynote and later that year in December accompanying an unrelated story in the business section of the Chronicle about Apple, Inc. 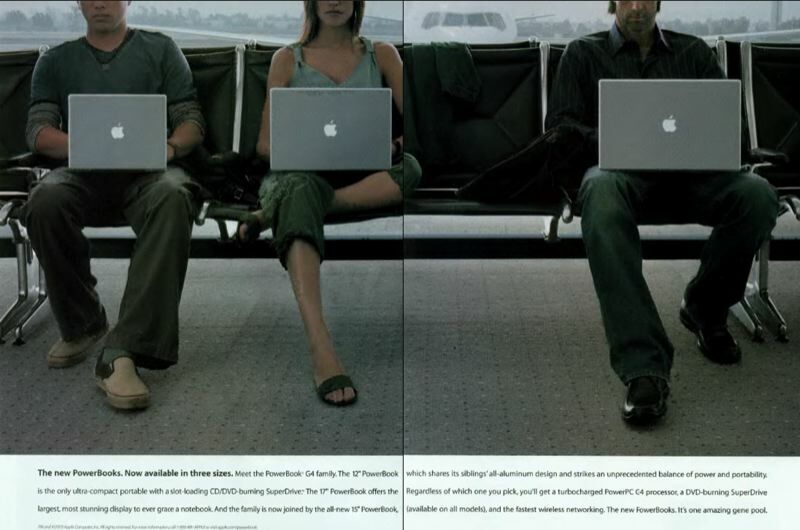 It would appear that the photographer took this photo due to its resemblance to an Apple ad from 2003 which featured a trio seated by each other using one of the three models of the aluminum PowerBook G4 on their laps. It is unknown whether the 15-inch and 17-inch Mac notebooks being used by the other two journalists are the aluminum PowerBook G4, but Leo is equipped with the ultra-portable aluminum PowerBook G4 12-inch model. Note: This image is used with permission from the San Francisco Chronicle. The highlight of my time with PowerBook Central was covering the Macworld Expo in 2007 (iPhone and Apple TV), 2008 (MacBook Air), and 2009 (Apple’s final appearance), where I live-blogged the event for the website. In my job at Bay Area Newsgroup, I was also able to squeeze in a couple of Apple-related stories with a local angle, the first on an iOS developer preparing for the release of the iPad by porting his game for iPhone and iPod touch over to the new device (originally to be a story earlier that year focused on Macworld Expo 2010) and the second, a story on a software developer for the Mac showcasing his products at Macworld iWorld 2012. As a new writer to Low End Mac, I once again will be able to write about topics I love: Apple and Macs! So did you catch the play on words for the name of my column on this website? It’s not that hard to pick up on, really! If you didn’t catch it, just say the title of this section somewhat fast with an emphasis on the “O” and then you should get it. Got it? Alright!